Back in the summer of 2014, I read Renata Adler’s critically acclaimed debut novel, Speedboat (1976), a book that narrowly missed out on a place in my highlights at the end of that year. Pitch Dark was her follow-up to Speedboat, published some seven years later in 1983. Just like its predecessor, Pitch Dark features a first-person narrative relayed in a fragmentary, non-linear style. The narrator, Kate Ennis – a journalist by profession – is in the process of breaking up with her lover of eight years, a non-committal married man named Jake. At various points during their affair, Kate has expressed a desire to go away with Jake for a few days, a weekend of rest and relaxation; Jake, for his part, always seemed somewhat reluctant to commit. The book is divided into the three sections, the first and third of which are fairly similar in style, both featuring vignettes from various points in Kate’s life intercut with reflections on the nature of her relationship with Jake. In this respect, she adopts an analytical, self-reflective approach, frequently questioning herself about their time together. The first two quotes (along with a couple of others) recur throughout these sections of the novel creating a sort of loop, returning to and building on earlier conversations as the narrative unfolds. The vignettes are wide-ranging and diverse, featuring stories of friends and acquaintances, musings on various subjects from American football to the finer points of law, and most affecting of all, the tale of a sick raccoon that takes shelter in Kate’s barn. The middle section is perhaps the most compelling – a relatively self-contained account of Kate’s brief trip to Ireland, an experience shot through with a strong sense of foreboding, paranoia and fear. While en route to a remote castle in the Irish countryside, Kate grazes a truck with her car, a hired vehicle from a rental agency. On noticing the car rental sticker, the truck driver decides to confer in private with a local policeman who then proceeds to tell Kate that everything has been taken care of. Kate, quite correctly as it turns out, suspects that some kind of scam is afoot, especially when the other driver is reluctant to exchange licence numbers. Nevertheless, she continues on her way to the castle where the welcome she receives is rather brusque, to say the least. The retreat’s owner, an ambassador, has assured Kate that his staff will take care of her. ‘Talk to them, the ambassador had said, they are a friendly people.’ As it turns out, they are anything but. On her arrival, Kate is virtually ignored by the cook and the housekeeper – the latter is particularly obtuse in her treatment of this guest, particularly when asked for directions to a nearby house. The strained visit ends with an anxious drive through the night as Kate attempts to get to Dublin to catch a morning flight out of the country. In her lack of familiarity with the Irish roads, Kate takes a wrong turn somewhere, a diversion that leaves her perilously short of petrol. As a consequence, she must rely on the assistance of an unfamiliar lorry driver (‘her teamster’) in finding her way to the capital. Haunted by the incident with the earlier truck driver, Kate is convinced that the authorities must be on her trail – every light and every vehicle seems to pose a potential threat to her safety. 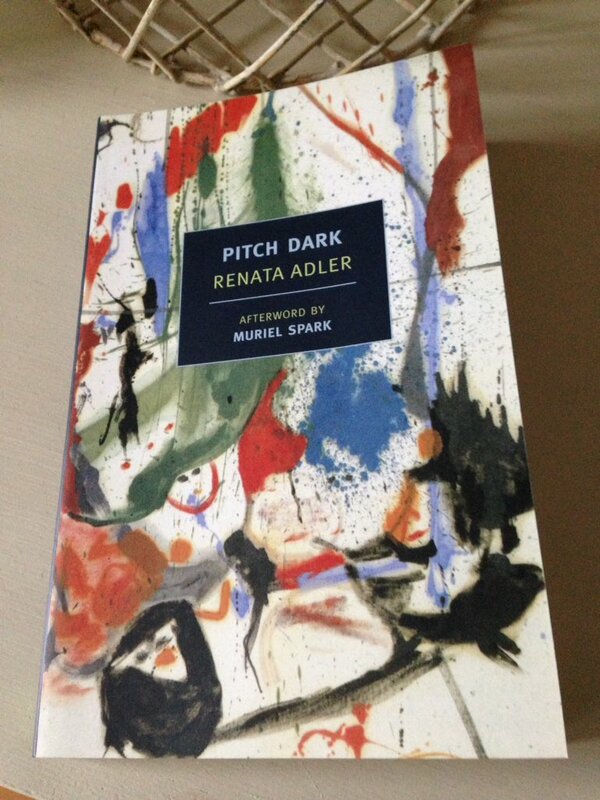 Pitch Dark is a book about love and longing, about what is left and what might have been. In some ways, Kate seems to be reaching out to Jake, communicating on paper some of the thoughts and feelings she has been unable to express in person. At one point in the story, there is a blurring of the margins between the author and the narrator, a move that left me wondering how much of Kate Ennis was based on Adler’s own personal experiences. Either way, it is a difficult book to capture in a review, one that is almost certainly best to experience in person. While the style of Pitch Dark might not appeal to everyone, it does serve as an intriguing companion piece to Adler’s earlier novel, Speedboat. This is another perceptive, erudite piece of work by Renata Adler – all credit to NYRB Classics for publishing it. This entry was posted in Adler Renata, Book Reviews and tagged #ReadWomen, Book Review, Classics Club, Fiction, Novella, NYRB Classics, Renata Adler, US on April 4, 2017 by JacquiWine. Renata Adler is an American author, journalist and critic – she worked for The New Yorker for over four decades. Her first novel, Speedboat, published in 1976 won the Ernest Hemingway Award for best first novel. The notes on the back of my NYRB Classics edition state that when Speedboat arrived in the mid-seventies, it was ‘like nothing readers had ever encountered before.’ Speedboat doesn’t follow a conventional narrative arc; nor does it possess a noticeable plot as such. What we have here is a series of fragments from the life of an American investigative journalist, Jen Fain, seen through the eyes of this woman as she is our narrator, our guide through this fascinating work. Episodic in style and form, Speedboat presents a collection of Jen’s reflections, observations and vignettes from a variety of stages in her life ranging from her days at boarding school and college, her time as an investigative journalist, as a speech writer for a political candidate and more. We encounter the inhabitants of Jen’s brownstone in New York, friends and acquaintances, taxi drivers, and some of the subjects of her journalistic dispatches from around the world. Jen’s lovers and partners also feature, but these characters appear to be on the periphery of her story, coming and going into the frame from time to time. Speedboat is a revelation; broad in scope, intimate in detail. Adler brings a deep intelligence to this work, and the quality of her writing is top notch. It’s a book to savour, one I’d love to revisit in the future. I can’t recommend Speedboat highly enough, although it might not be to your taste if you like plot-driven narratives and novels that follow fairly conventional principles. If you’re in the mood for something different, however, something that seems way ahead of its time in terms of pushing the boundaries of the novel form, then Speedboat could be for you. 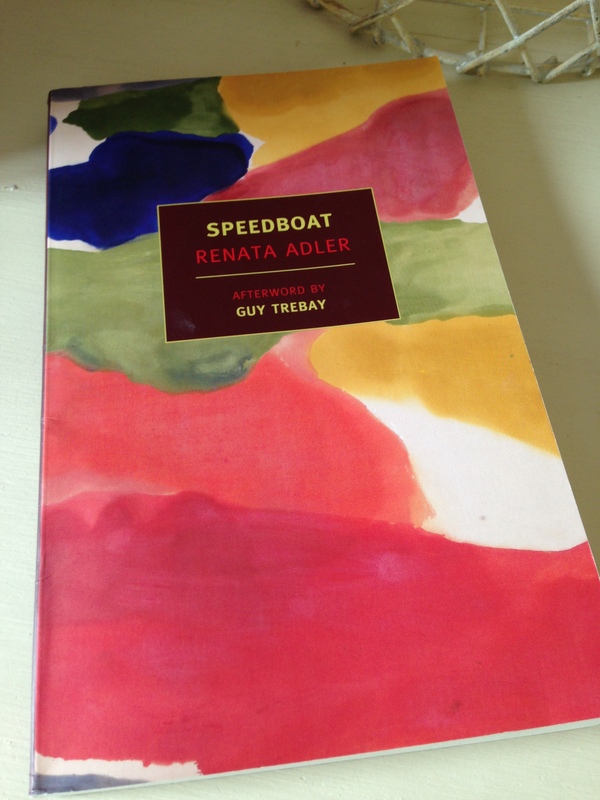 Speedboat is published in the UK by NYRB Classics. Source: personal copy. This entry was posted in Adler Renata, Book Reviews and tagged #ReadWomen, #ReadWomen2014, Book Review, Fiction, NYRB Classics, Renata Adler, US on August 18, 2014 by JacquiWine.